A sister ship to the famous RUNNING TIDE, MAREA was built in wood by the famous Cantieri Carlini in Rimini, Italy. Fast and good looking, she has full accommodations below her flush deck and is very well equipped. United Yacht Sales New Jersey would love to guide you through a personal showing of this 60' Sparkman & Stephens Wooden Sloop 1977. 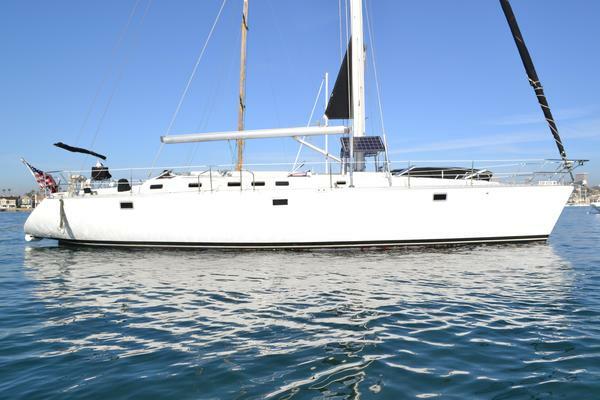 This yacht for sale is located in Salerno Italy and priced at $295,000. For a showing please contact us by filling out the form on this page and we will get back to you shortly! The interior is matte finished teak with teak and holly floorboards. The light and airy aft stateroom has berths on either side and a bench seat in between with a mirror over it. There are two large hatches overhead with fabric curtains to darken the room. The en-suite head is forward to starboard. The door forward to port leads into the main salon past the navigation station. The engine room is amidships under the companion way ladder. Opposite to starboard is the galley. Forward, the main salon has U shaped settees on either side with tables that fold out. Next forward to port is the guest head with a door into the main salon and direct access to the port twin cabin with upper and lower berths. Opposite to starboard is the second guest cabin with upper and lower berths and a door forward into the crew head. The crew quarters is next with a double cabin to port with upper and lower berths as well as two pipe berths aand sail and equipment storage forward. Mahogany planking over white oak frames covered on the outside with fiberglass and epoxy. Deck and cockpit are teak. External lead fin keel and skeg hung rudder.